Li Ji is very difficult to translate. Li means “internal” while Ji means “urgency, urgent, anxious, impatient, rapid, fast, irritated, annoyed, violent, hot-tempered, hot-headed.” The pictograph depicts a hand grabbing the heart. Most modern Chinese doctors agree that “internal urgency” refers to “anxiety” and I agree with this view. However, some think that “li ji” refers to an uncomfortable, tight sensation from the lower abdomen upwards towards the heart. Some translate “li ji” as “tightness” or “abdominal tightness”. This is also an acceptable interpretation as, with rebellious Qi of the Chong Mai, there may be a tightness of the abdomen and especially one experienced as propagating from the lower abdomen to the heart. As it often happens with Chinese medical terms, they may have simultaneous translations which may be all valid. In general, I interpret “Li Ji” as a feeling of vague anxiety and restlessness. Indeed, anxiety may manifest (in some cases) specifically with rebellious Qi of the Chong Mai. If it does, it gives important implications for treatment because it means we need to subdue rebellious Qi of the Chong Mai and treat the lower abdomen “stabilizing” the Chong Mai in the lower abdomen. We can do this very simply with Ren-4 Guayuan and KI-13 Qixue. I translate the word “ni” as “rebellious” as that is its main meaning in Chinese. Most authors translate it as “counterflow” which accurately describes the pathology, i.e. Qi flowing against its normal direction of flow. I like to keep the translation as “rebellious” because it is very descriptive of the pathology of Qi going the wrong way and also because the word “rebellious” reflects the Confucian influence on Chinese medicine. Confucianism had a profound influence on Chinese medicine, as big or even bigger than that of Daoism. Confucianism is a humanist philosophy that sought the best way to ensure harmony in the family, society and the State. At the root of this philosophy is the correct behaviour based on ren, yi, li and xiao. All these terms are extremely difficult to translate but they are roughly “compassion”, proper behaviour, rituals and filial piety. The “proper” behaviour is based on the six relationships, three in the family and three in society, i.e. Those on the left (in the above list) of these relationships have a duty of care towards those on the right, e.g. parents caring for the children. Crucially, those on the right have a duty of respect and obedience towards those on the left, e.g. children obeying the parents and subjects obeying the sovereign. When this respect and obedience is lacking, they are “rebellious”. It is interesting that the word “ni” occurs very frequently in the Nei Jing. The opposite of “ni” is “shun” i.e. “following the rules, obeying”. illness is as much an ethical problem as a medical one. In the context of Qi counterflow, “shun” also means “going in the same direction as”. The two pathologies of “Ni Qi”and “Li Ji” cause a feeling of heat in the head and cold feet. This feeling of heat is neither Full nor Empty Heat: it is simply a Chong Mai disharmony. The feet feel cold because, as Qi is rebelling upwards, there is less Qi going down to the feet in the descending branch of the Chong Mai. The schematic diagrams of the Chong Mai on the left illustrate the pathway of the Chong Mai: starting in the Lower Dan Tian in the Uterus area, going down to Ren-1 Huiyin and from here to ST-30 Qichong from where it goes to KI-11 Henggu and follows the Kidney channel up to KI-21 Youmen. It goes to the chest, scatters in the breast and flows up to the throat, chin, around the mouth and into the eyes. A branch descends from ST-30 Qichong on the medial side of the leg to the ankle where it separates: one branch goes to the Kidney channel on the sole of the foot and one to the big toe and the Liver channel. 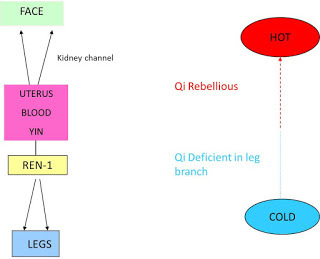 It should be noted that the rebellious Qi follows the Kidney channel in the abdomen and all the Kidney points from KI-11 Henggu to KI-21 Youmen but its “rebelliousness” depends a lot on the Liver channel which should therefore also be treated. It is very important to note that, in order to diagnose Rebellious Qi of the Chong Mai it is not enough to have “Li Ji” and “Ni Qi” but it is necessary to have various abdominal, chest or breast symptoms at different levels. Rebellious Qi of the Chong Mai causes various symptoms at different levels of the abdomen, chest, breast and throat. It causes primarily fullness, distension or pain in these areas. By plotting the pathway of the Chong Mai, we can list the possible symptoms of rebellious Qi of the Chong Mai starting from the bottom. These are illustrated in the Figure below. Please note that in order to diagnose Rebellious Qi of the Chong Mai, there should be at least 3-4 symptoms at different levels, for example, painful periods, epigastric fullness, breast distension and feeling of lump of the throat. If, in addition to these, the patient also has some anxiety, a feeling of heat of the face and cold feet, we can then diagnose Rebellious Qi of the Chong Mai. If all the symptoms were in the lower abdomen, e.g. painful periods, abdominal fullness and a feeling of masses, then this is not Rebellious Qi of the Chong Mai. A symptom that would be very distinctive of Rebellious Qi of the Chong Mai is a feeling of energy rising all the way from the lower abdomen to the throat: however, very few patients report such a symptom. What makes the Qi of the Chong Mai rebel upwards? 1) The Qi of the Chong Mai can rebel upwards by itself due to emotional stress that makes Qi rise or stagnate. This condition is Full and I call it “primary” rebellious Qi. I think that what I call a secondary Rebellious Qi of the Chong Mai, i.e. 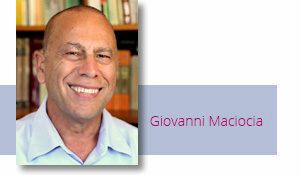 the one arising from a deficiency of the Kidneys and of Blood in the lower abdomen is more common. Of course emotional stress plays some role also in what I call “secondary” Rebellious Qi of the Chong Mai. Rebellious Qi of the Chong Mai may be a complicating pathology in various gynaecological conditions, such as premenstrual tension, painful periods and menopausal problems. For example, if a woman suffered from painful periods with dark and clotted menstrual blood, we would diagnose stasis of Liver-Blood. But if in conjunction with the painful period, she also experienced epigastric and breast distension, nausea and anxiety, then we can diagnose that the Liver-Blood stasis is aggravated by Rebellious Qi of the Chong Mai. During the menopause, Rebellious Qi of the Chong Mai is also a frequent aggravating pathology. 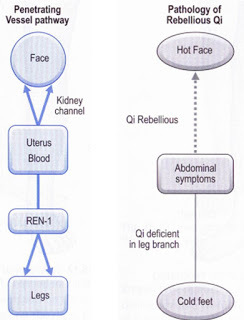 Menopausal symptoms are due to the decline of Kidney-Jing: however, they may be aggravated by Rebellious Qi of the Chong Mai. Indeed, the onset of the menopause itself may trigger off (not cause) Rebellious Qi of the Chong Mai, especially in the presence of the above-mentioned emotional stress. This is due to the phenomenon by which the onset of the menopause “destabilizes” the Chong and Ren Mai in the lower abdomen: as a result of this, the Qi of the Chong Mai may rebel upwards, especially when it is stirred by emotional stress. The acupuncture treatment of Rebellious Qi of the Chong Mai is illustrated in the two Figures below. The numbers in front of the acupuncture points indicate the order of insertion.